Zendesk Explore is the latest generation of reporting for Zendesk products. Depending on when you purchased Support Professional or Enterprise, you might not have access to Insights (see Understanding your reporting options). For help with Explore, see Zendesk Explore resources. Insights provides advanced reporting and metrics. You can use pre-built reports or build your own custom reports on configurable dashboards. Insights is powered by GoodData. Slice and dice data. Filter on data and drill down to understand the details behind your support behavior. Use pre-built dashboards and reports. Get metrics relevant to your Zendesk immediately with pre-built reports and dashboards. Build custom dashboards and reports: Create your own reports and publish reports to a configurable dashboard. Keep reports up-to-date with regular data exports: Your Zendesk Support ticket data is exported daily to sync your Insights project with the current state of your Zendesk. Ticket data is exported daily on Professional and hourly on Enterprise. Note: The hourly sync begins one hour after the previous sync ends. So if you have large ticket volume, and it takes more than one hour to sync, you won't get exactly one sync every hour. Insights is available for Support Professional and Enterprise. You must be an admin to set up Zendesk Insights. Agents need to enable Insights for themselves in Zendesk after an admin sets up Insights. For information about using Insights, see Opening Insights and getting around. For more resources see Insights resources. Any admin can enable Zendesk Insights. Only one admin needs to do so. The first admin to enable Insights creates the Zendesk Insights project, and is added as a user to the project. After that, each admin and agent needs to personally enable Insights to add themselves to the Insights project. Note: User provisioning and role management for Insights is handled through Zendesk. For information, see Understanding and restricting user permissions in Insights. Click the Reporting icon ( ) in the sidebar, then click the Insights tab. Review the GoodData Terms of Service, then click Agree to term of service, if you agree. It might take a few minutes to set up the project and load data. When the project set up is complete, click Get Started again. Insights automatically loads. Now agents can enable Insights for themselves (see Enabling Insights for yourself). To understand agent permissions, and to set permissions in Enterprise, see Understanding user permissions in Insights. For information about using Insights, see Opening Insights and getting around. Insights data will update once an hour for Enterprise and once a day for Professional. To set the sync time, see Setting the daily sync time for Insights (Professional). Insights data syncs with your ticket data hourly on Enterprise and daily on Professional. During the sync your current ticket data is exported, then your Insights project is updated. Each sync begins one hour (Enterprise) or at the time you configured on the Reporting > Insights tab in the account local time zone (Professional) after the ticket data export completes and your Insights project data is updated. So your Insights project update might not occur at the same time each hour or day. On Professional, you can set the daily sync time. When you change the sync time, the change will take effect the day after your next regularly scheduled sync. This is because sync time changes are communicated during a scheduled sync. For example, if your sync time is 3 pm, and at 1 pm you change your sync time to 2 pm, your daily sync will happen at 3 pm that day. The next day your sync will start at the new time, 2 pm. Or, if your sync time is 1 pm, and at 2 pm you change your sync time to 3 pm, your daily sync will happen at 1 pm the next day as previously schedule. The day after that your sync will start at the new time, 3 pm. Click the menu beside Daily Sync, then select a sync time. The change will take effect the day after your next regularly scheduled sync. Insights uses the time zone that is set for your Zendesk account. For information about setting your time zone, see Setting the time zone and format for Zendesk Support. For date attributes, when the GoodData query engine queries the database for a date attribute, it refers to the time zone that is set for the project, and calculates the metrics associated with the date accordingly. For example, if a ticket is created Wednesday, January 1st, 2014 at 5:00pm PST, and the Insights project time zone is set to America/Los_Angeles (-8:00), then a count of tickets by Date (Ticket Created) would count that ticket as being created on January 1st, 2014. If the project time zone was set to UTC (0:00), then the time would register as Thursday, January 2, 2014 at 1:00 AM GMT, and a count of tickets would associate the ticket with January 2nd, 2014. Each of these is defined relative to the time zone that is set for the project. Hour attributes are calculated based on time zone during the hourly (Enterprise) or daily (Professional) sync, and are static after they are loaded into the project. For example, if a ticket is created on Wednesday, January 1st, 2014 at 5:00pm PST, and the Zendesk Support account time zone is set to PST, then the Hour Ticket Created will be set to 5. If the time zone is updated to GMT, then that tickets hour will still be 5, but the hour calculated for tickets going forward will be in GMT. 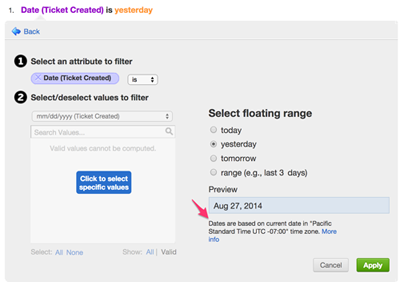 When you change your Zendesk Support time zone, the time zone boundaries for Date attributes are updated immediately. Hour of Day metrics are computed in the new time zone going forward after your next sync. Historical Hour of Day attributes are not updated. I do not see the Zendesk Insights tab. The link redirects me to https://www.zendesk.com/explore/ to register. Submitted a support ticket with no help yet. I see you were able to get this sorted out in a ticket - sorry for the delay! We're dealing with a really high volume of tickets right now. Please let us know if you need anything else! I'm confused - I'm a long-time insights user on an enterprise plan and I do not see this option for setting the daily sync time. Is there something I must enable? There's not a daily sync time option on Enterprise because you automatically get hourly syncs. That setting is for Professional plans because they get one sync per day. Is there a way to trun off Insights once it has been turned on?